– which isn’t bad considering how little I actually trained. Now I am super excited to actually train for a race and improve on that time! 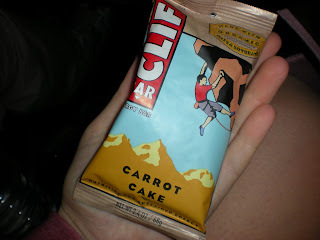 First let’s take a step back and see what I ate to fuel this run: half a Carrot Cake Clif bar – I la-la-loved this flavor. I gave the BF the other half and he thought it was so-so. I absolutely love fall flavors like this and pumpkin stuff. 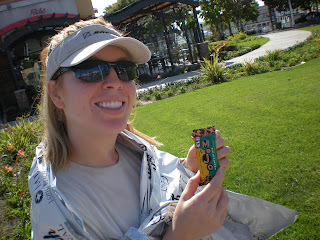 I am on the lookout for the seasonal Pumpkin Clif Bars – they are so good. 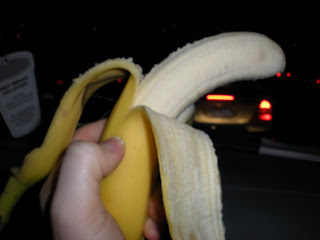 I also ate 2/3 of this naner when we were getting close to the race. Important Note: I do not normally eat before I run on weekdays since I usually run first thing in the morning. But, I do advocate eating before you run if you can/have time. I do think it really helps keep you going and push yourself harder. I eat before races because I have extra time from the moment I wake up to the time I actually arrive at the race. This does not work for most people. Most of the time your stomach will get really pissed at you for doing something “new” the day of a race. Don’t ever try something “new” on race day, be it new food, new drinks, new clothes, new shoes or new anthing! It’s not a good idea. Luckily, these foods are foods I eat all the time so my stomache doesn’t freak out. Actually, I like to joke that my stomach is like a steel cauldron. I am going to try to start eating before my long run on the weekends so I will be more used to it the next time I have a big race. and a yogurt my mom had packed. Thanks mom! 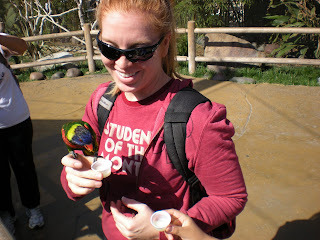 After the race we went to the Aquarium of the Pacific. Race entry actually includes free admission which is totally cool so the fam took advantage and went with me. Since the aquarium is right next to the race I went stinky – we didn’t want to go all the way home and drive back so I just brought clean clothes and changed inside the restrooms. I still stunk, but not as bad. 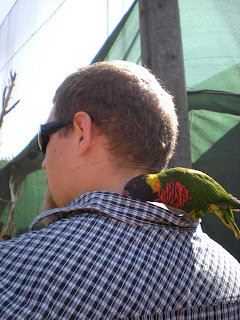 The Lorikeets didn’t seem to mind me smelling, this guy loved me actually. This one loved the BF and wanted to crawl in his shirt! 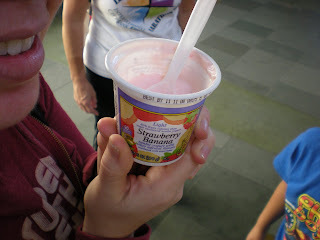 After walking around the aquarium for a while I was HUNGRY! After races I pig out. I deserve it, why the heck not?! I read how some people go home for a healthy sammie or something – f that. When else am I going to eat fried foods guilt free? After a race I eat whatever I want and don’t feel bad about it. That is bliss 🙂 We went to Islands. 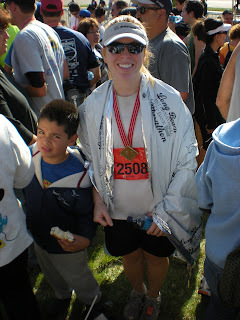 I actually went there last year after the LB half too! Ha. 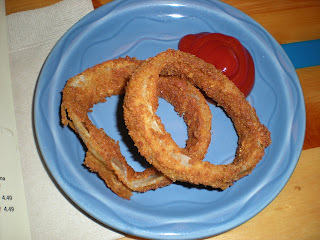 Anyways, we started with an appetizer of onion rings. I only ate these 2 since everyone else was hungry too and scooped them up fast! I ordered a tuna sandwich for my main course and it came with shredded cheese, which I feel takes away from the tuna so I scooped it off and gave it to the BF. 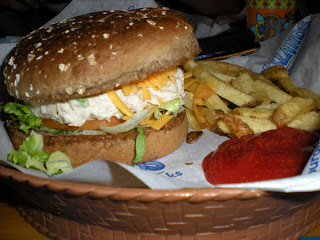 It also came with fries which I happily ate. I don’t normally get my own fries and just steal the BF’s. He must secretly hate me for it. Oh well. I also had bites of the BF’s and my mom’s burgers. Yum! 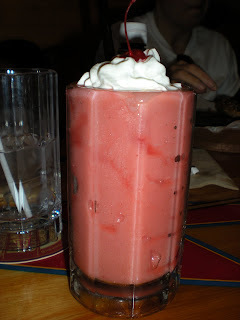 Worth every calorie! Overall it was a good day. 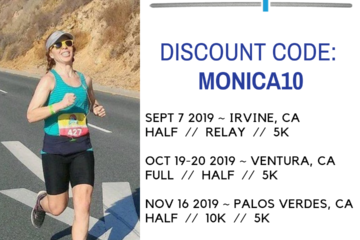 I was very happy with my race results and am very motivated to really train for a full marathon now! I know it is going to be super hard, but it is something I have wanted to accomplish for a long time. I am probably going to be super hungry on Monday because it seems my hunger is delayed one day after a long run. Isn’t that random? But since I did eat so much after the race it might balance out okay. 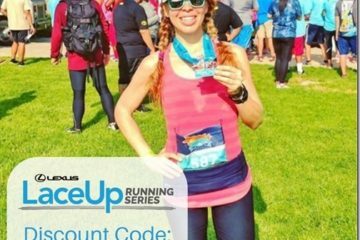 Happy running to everyone out there! Hangry Pants – That ice cream is super good if you like chocolate, toffee, pb cups and anything else delicious, since it’s all in there! Congratulations! I would eat my face off if I ran a half marathon. 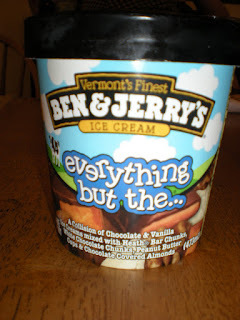 I love Ben and Jerry’s. Never had that flavor though! Chandra – Thanks! I’m glad we’re on the same page on after race eats! Just me – Thank you on the kudos. Yeah, isn’t weird that you’re not hungry for a while after? My family always expects me to be famished, but I need some time. The BF – I am soooo NOT there yet. May be someday?! What?! You just ran a half-marathon! CONGRATULATIONS, that is beyond awesome! And you totally earned the treats and then some 🙂 wonderful, wonderful, wonderful! kudos to you and the race!!!!! i’ve watched lots of friends run that race but never run it myself!!! you did such a great job! and i’m like you after a race…not hungry for a while, then i hit a wall, pig out, then get a dehydration headache. hehe! OMG!! HUGE CONGRATS TO YOU!! You rocked it, that is so amazing!! You give me more motivation for this weekend. 🙂 Ahhh!! You did so great!! Congrats! !